Common Core comes to gym class: Worksheets and word walls in PE. Is Common Core Ruining Gym Class? No kids, we aren’t playing speedball today. We are sitting down and working out our minds. When Judy Schmid, a gym teacher at Jacobsville Elementary School in Pasadena, Md., teaches her students how to bowl, she has them score games manually, even though most modern bowling alleys have automatic scoring. Kids count fallen pins, show their calculations on worksheets, play number games, and by the end of one 30-minute gym class, they’ve done a lot more than knock down a few pins—they’ve knocked off several Common Core math skills too. Yes, even gym teachers are under pressure to teach to the controversial new Common Core standards, which are reshaping teaching and learning (not to mention political alliances) across America. The Common Core calls for cross-disciplinary teaching and the reinforcement of foundational English and math skills in not only core academic subjects, but in art, music, and gym as well. Test-score-conscious school principals, in turn, see any extra math and reading practice as a way of helping children perform better on the all-important standardized tests that increasingly determine the fate of their schools. Who needs exercise when gym class can serve as yet another 45-minute opportunity for teachers to shoehorn in vocabulary and multiplication drills? The Common Core’s growing influence over courses widely perceived as more elective than academic speaks to a central tension as the controversial standards take effect in 46 states across the country: If done well, the Common Core should inspire instructors to work in a much more collaborative and creative fashion across subject areas. But if done poorly, untrained and frustrated teachers can wind up feeling forced to teach skills and lessons they don’t fully understand, and students suffer. In this sense, the success—or failure—of this unprecedented expansion of academic content into gym class can be seen as a barometer for the health and well-being of the entire Common Core. Schmid embraced the new expectations with gusto, spending hours studying the standards and scouring the Internet for physical-education–specific lesson ideas. But not all gym teachers are getting the training or taking the time to incorporate Common Core skills thoughtfully or well. 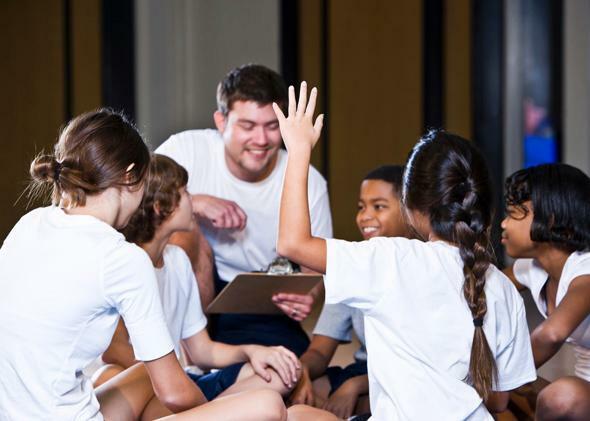 Michael Fisher, a New York-based instructional coach and consultant hired by schools and districts to help teachers align noncore subjects to the standards, notes that gym teachers aren’t trained to teach English and math. Teachers often tell Fisher that they feel unprepared and intimidated, both by the Common Core and teaching outside their specialization. And because gym teachers often have students of all grade levels, some say they now feel pressured to learn a staggering number of standards. Training varies across school districts, with some gym teachers receiving minimal background on the Common Core and others receiving more helpful coaching that’s targeted to phys ed. Inadequate training can lead to clumsy incorporation of the standards, like simply drilling children on vocabulary words in gym class. It’s fine, for instance, for teachers to explain the meaning of a deltoid as their students stretch, but Fisher says written vocabulary tests should not replace physical activity. Unfortunately, in some schools, poorly trained gym teachers are now limiting exercise time, or forgoing it entirely, in a confused effort to incorporate the Common Core. This, as many schools are already struggling to comply with federal government guidelines that suggest children get at least 60 minutes of physical activity a day. Timmy Dhakaia, a senior at Brooklyn’s Midwood High School, says she and her classmates now spend so much gym time on written exercises and tests that they don’t always have time for, well, gym. Dhakaia doesn’t mind the health-related articles that her gym teachers have started assigning for homework. It’s the in-class written work that’s annoying. For example, after a yoga session, the teacher will ask students to fill out a simple worksheet on which parts of the body each pose strengthened instead of just doing more yoga, or another physical activity. One strategy for integrating literacy concepts into phys ed is to reimagine what constitutes a “text,” says James-Hassan. Instead of asking students to read articles or write essays in gym, she suggests students learn what the lines signify on the gymnasium floor, or compare ingredients on a nutrition label. Talking about a sports controversy at the beginning of class is another technique for sparking discussion and helping students learn how to frame arguments, both skills valued by the Common Core. But even these more creative suggestions sacrifice students’ physical activity. Peter Terbuska, a veteran phys-ed teacher in Wyoming, N.Y., initially had mixed feelings about teaching the Common Core in his classes. He wanted the best for his students academically, but he didn’t want to cut down on time they spent being active. Also, “there was no preparation for it whatsoever.” Slowly, though, after talking with other teachers and learning what kids were doing in other subjects, Terbuska came around to the idea. Since students were studying multiplication tables in math, Terbuska started asking them to count by twos or threes while stretching in gym. “At first it was like pulling teeth,” he said. Now, though, the kids are used to it and even excited about leading the group stretch. Simply posting sports-related words on the wall is another popular way teachers are sneaking literacy standards into the gymnasium. The irony, says Terbuska, is that he first proposed putting up a “word wall” five years ago but encountered resistance from the administration. “I was told that it wasn’t something necessary for phys ed,” he said. Times have changed.